Catholic News World : #BreakingNews Football Team of 12 Boys Rescued Alive from Flooded Cave in Thailand - Prayers Answered! 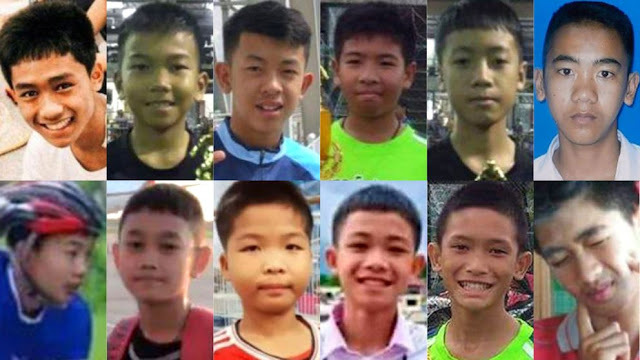 #BreakingNews Football Team of 12 Boys Rescued Alive from Flooded Cave in Thailand - Prayers Answered! A football team of 12 boys and their coach captured world attention when they were rescued after 18 days trapped in flooded cave. The rescue operation was extremely difficult and saw 1 diver killed in the rescue attempt. 12 boys and the football coach were trapped in the Tham Luang cave on 23 June. The Thai Navy Seals, coordinated the rescue operation, announced on Facebook: "All 12 Wild Boars and coach have been extracted from the cave. All are safe." The process started two days ago, when the first four boys were brought above ground. Four others were saved yesterday and the last four boys arrived together with the coach. The operation will end, when the re-emergence of four rescuers, including a doctor, who remained with the football team when they were found.